First Love White Tea is a blend of the famous Silver Needle white tea with Pink Rose Buds. Silver Needle white tea has leaves that looks like a long blade or needle with a lot of white fur. 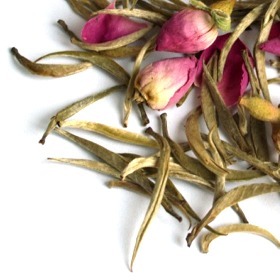 First Love White Tea scented with pink rose bud petals will make you love it. First Love White Tea tastes gentle, smooth, sweet with lingering rose fragrance. First Love White Tea definately a yummy blend. Beautiful, delicate, romantic, just lovely! The rose is just the right amount to add to the aroma, yet not add any soapy taste. I find this cup has a surprising amount of body for a silver needle This is my new favorite white. Highly recommended!